With its Hogwarts-style colleges, dreamy spires and picturesque streets brimming with history, it’s not hard to see why countless tourists flock to enchanting Oxford each year. But while it might be home to the oldest English-speaking university in the world, Oxford is also a modern student city brimming with exciting things to do and see, for people of all tastes and persuasions. Here’s how to get the most out of this magical city in a day, for under £20. Oxford has an overwhelming abundance of sights and historical points of interest, so the best way to get to grips with all the city has to offer is by taking an expert-led guided tour. Footprint Tours provides a wonderful two-hour tour of Oxford’s most renowned locations and the knowledgeable guides will delight you with the stories and facts behind the city’s historic streets and buildings. 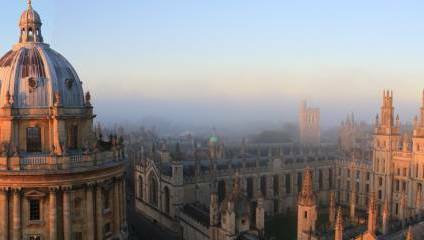 Highlights include many of the famous colleges, the Bodleian Library, the Radcliffe Camera, and details about all the eccentric ceremonies and experiences that make Oxford such a singular place to live and study. Have your camera at the ready, there’s a lot to take in during this fantastic, free tour. Footprint Tours meet at 5 Broad Street, Oxford, OX1 3AJ. Further information and booking enquiries can be made online. For a lunchtime treat, do as the students and stop by Oxford’s Covered Market. Offering a unique showcase of the city’s best crafts, food, and drink, the Covered Market has over 50 stalls to meet your needs. For wholesome, delicious home cooking, head over to Alpha Bar, where Tuscan beef stews, sweet potato curries, goulash, and beautiful salads are dished out in generous portions from just £4.50, or if you have your eye set on pie, there’s no better place to go than Pieminister where good old British grub is served up from only £5. The Covered Market is located on Market Street, Oxford OX1 3DZ. As you might expect from such a distinguished university city, Oxford has a wealth of fascinating museums, including the oldest public one in Britain, the prestigious Ashmolean museum. However, for a quirkier experience, an afternoon exploring the anthropological Pitts River Museum should definitely not be missed. Founded in 1884 by archaeologist Augustus Pitt Rivers, this treasure trove of oddities began with 20,000 items and has since grown to encompass a whole host of weird and wonderful exhibits from all around the globe. Shrunken heads, Eskimo suits, and a witch in a bottle are just some of the fascinating objects on show. The Pitt Rivers Museum is located on South Parks Road, Oxford OX1 3PP. Oxford’s Botanic Garden is the oldest of its kind in the country and is a delightful reprieve from the bustling streets. Founded as a physics garden in 1621, this gorgeous garden holds 6,000 varieties of plant, along with stunning glasshouses and some of the UK’s oldest redwoods. This oasis of biodiversity is a marvel for research and education, and provides the perfect escape for those looking for quiet contemplation. The Botanic Garden is located on Rose Lane, Oxford OX1 4AZ. Tucked away between Gloucester Green and Magdalen Street, The White Rabbit is an unassuming traditional pub that also happens to serve up some of the best pizza in town. Thanks to its delectable menu and affordable prices, this pizzeria is notoriously busy, but even if there’s a wait, it is definitely worth sticking around for. With an impressive list of pizza options, including gluten-free choices, you’ll soon discover why this Oxford hot spot is a firm favourite with locals and visitors alike. The White Rabbit is located at 21 Friars Entry, Oxford OX1 2BY. So there we have it, a full day of fun and culture in Oxford for just £11. Now that you’ve been schooled on how to do it, there’s no excuse not to visit this beautiful city as soon as possible!